Tegel airport is the very embodiment of exchange, a curious place of transition, a portal between two realities embodied in the space beyond the gate. The hours spent in the airport lead us to a ‘non-place’, where we are encouraged to shop, to eat, to wait – we are caught in limbo. Yet, it remains a realm in its own right, autonomous. The anonymous solitude of these non-places offers the transitory occupant the illusion of being part of some grand global scheme: a fugitive glimpse of a utopian city-world. The imminent closure of Tegel airport marks an important change in the way air travel is organised and experienced. Its design is of a time when flight was associated with glamour, fantasy, technological progress, romantic chance encounters and fictional disasters. The building consists of a large concrete hexagonal structure, punctuated with brightly coloured check-in desks, a corridor at its perimeter. Viewing platforms and executive lounges make up the circumference of the building, inviting the traveller to enjoy a navigable thoroughfare instead of the shed-like enclosure of much of today's airport architecture. There are commissioned art works, restaurants and bars, cafés and shops. The décor follows the distinctive, bright colour schemes of its age throughout, right down to the plastic sinks and hand dryers in the restrooms. What Tegel Airport will become remains uncertain. While there have been proposals and public discussions about the next incarnation of this elegant building, it is now possible that Tegel will simply continue as an airport. Tegel: Speculations and Propositions created an opportunity for both artists and writers to consider how this space might be occupied in the future, and what in the past it symbolised for the people isolated in West Berlin. Air travel is hardwired into the imagination, such as the cinematic (disaster, romance and action movie all in one), and into concepts of cultural mobility, exchange and internationalism. Tegel stands for a time when technological progress was synonymous with human progress and when air travel was still exclusive. This publication has evolved as a consequence of the failure of Tegel to close. In November 2012, we interviewed the airport’s architect, Meinhard von Gerkan, in his Hamburg offices. The interview investigates the freedom in airport design before terrorist attacks, and speculates on the possible future usage of the building. Eight writers have been commissioned to develop their ideas around the past, present and future of Tegel, and the artists whose films are included on the DVD have submitted short texts to accompany their videos. For authors and artists alike, a mental playfulness can be observed, with clear origins in the inspired architecture of the airport. While some focus on the architectural parameters of the terminals, others use its contextual and relational design as a particular mise-en-scène of various narratives. These artists and writers and their collaborators masquerade in multiple roles, such as researcher, communicator, performer, guide, and time traveller. The constructions of time and space in history and fiction, of borders as well as the duration and autonomy of that multi-layered space as architecture and idea, remain central to everyone’s investigation even though some of the contributions hardly touch ground in Tegel. The Berlin artists in particular present that ‘phantomschmerz’ they most certainly share with half of the city’s population and which results in some rather dystopian fantasies about a possible future of the site. At the time of writing, the possible resurrection of Tegel as a centre of new technologies and economies drags on, the opening of the airport in Schönefeld postponed, thus happily preserving the imaginary potential of the site and leaving open a gap for further speculations. TEGEL: Speculations and Propositions started out as a programme of short, artists’ videos made in response to the imminent closure of Tegel Airport and screened in June 2012 in Berlin, to mark its planned closure. The screening, Tegel: Flights of Fancy, was organised by Jaspar Joseph-Lester, Susanne Prinz and Julie Westerman and built on a series of events, exhibitions and publications that have taken place through cross-cultural collaboration between artists based in the UK and Germany. Our approach to this project has grown out of the ongoing residency programme at LoBe, the public conference on ‘Hospitality’ at L40, and many other related projects that have helped to bring together a network of artists. Key to this development has been Brutalist Speculations and Flights of Fancy, a book and symposium led by Julie Westerman, that took six iconic brutalist buildings in Sheffield as a provocation for considering inventive ways that architectural space might be used, imagined and critiqued. Perhaps most importantly, this publication of art works by twenty-six artists and writers provided a platform for exploring the material, economic and political legacies of these architectural structures. 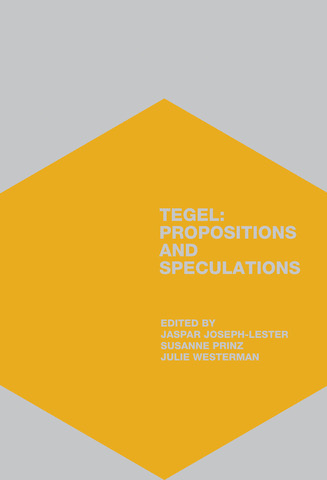 Tegel: Speculations and Propositions is, then, a culmination of our interest in the way collaboration, interdisciplinary research, and experimentation can produce new spatial knowledge. Over a period of eighteen months, a selected group of international artists and writers focused their attention on Tegel airport, they observed how it is used, they engaged in new activities and imagined how the building might function in the future. This book and DVD is the outcome of what might be described as an open-ended enquiry and, as such, embodies new perspectives on, and approaches to, urban renewal, regeneration, social organisation, mobility and the legacy of modernist architecture. This approach to site is central to imagining how art practice can slow down, re-orientate and redefine the successive cycles of master plans and regeneration schemes so that we can begin to consider what is at stake in the spaces we occupy. Book and DVD of original films by artists and writing. Originating from an analysis of on Tegel Airport, Berlin. Over a period of eighteen months, a selected group of international artists and writers focused their attention on Tegel airport, they observed how it is used, they engaged in new activities and imagined how the building might function in the future. This book and DVD is the outcome of what might be described as an open ended enquiry and, as such, embodies new perspectives and approaches to the problem of urban renewal, regeneration, social organization, mobility and the legacy of modernist architecture. This approach to site is central to imagining how art practice can slow down, re-orientate and redefine the successive cycle of masterplans and regeneration schemes so that we can begin to consider what is at stake in the spaces that we occupy.